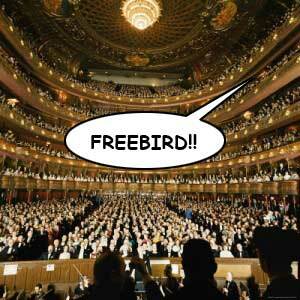 You are attending a concert and yell “Freebird.” How ironic are you being? The band you are seeing is Lynyrd Skynyrd or a Lynyrd Skynyrd tribute act. You actually want the band to play “Freebird” and would be delighted if they did. You are employing no irony and you have nothing to worry about. The band you are seeing is not Lynyrd Skynyrd. You yell “Freebird” at concerts like this because you believe it is funny to do so, although you cannot articulate why. You do not actually like “Freebird” all that much. If the band in question began playing it, you would feel surprised and a little insulted. You are employing one (1) level of irony and you are kind of annoying. The band you are seeing is not Lynyrd Skynyrd. You are aware that yelling “Freebird” at concerts is something only drunks from the suburbs do, and so by doing it yourself, you are transforming a cliché into a droll comment on the stale dynamic between performer and audience. If the band you were watching actually played “Freebird,” you would declare it the most awesome moment of your life. You are employing two (2) levels of irony and are probably wearing grandpa shorts, a porkpie hat and button-style earrings. The band you are seeing is not Lynyrd Skynyrd. You are aware that only slobbering drunks and tired hipster ironists think yelling “Freebird” at concerts is funny. When the first cries of “Freebird!” go up in the hall, you join in as a gesture of unbridled contempt, not caring that the bellowing masses around you have no idea how mercilessly you are mocking them. If the band actually played “Freebird,” you would snort in disgust. You are employing three (3) levels of irony and need to get laid with the desperate urgency of a desert wanderer searching for that life-saving drink of water. The band you are seeing is not Lynyrd Skynyrd. Years of cultural trend-surfing have left you such a hopeless contrarian that you feel secure in your own skin only when your behavior elicits groans and pained eye-rolling from those around you. You yell “Freebird” because only a douchebag would do it, and the last thing you want is to be mistaken for someone who cares whether someone else thinks he’s a douchebag. If the band you were seeing began playing “Freebird,” you would continue yelling. You are employing four (4) levels of irony and secretly wonder if you would have been happier growing up on a farm. The band you are seeing may or may not be Lynyrd Skynyrd. You yell “Freebird” because yelling “Freebird” is a cultural gesture that everyone knows and expects, a ritual that unites American concertgoers and affirms their commonality and shared purpose. Whether one does it ironically or not is beside the point, as both sides take pleasure from the act in their own way, and such opportunities to share a sense of community with people in these fractured times are too precious to pass up. If the band actually played “Freebird,” you would be delighted. You are employing five (5) levels of irony and are reasonably well adjusted. But still a little annoying. Thanks to Flickr user Watt_Dabney for the featured image.